LONDON — I’ve always balked at ARM Holdings plc (LON:ARM)‘s massive price-to-earnings ratio. Even after a 10% fall from last month’s high, the shares are trading at 46 times forecast earnings. Some say the pull-back is a buying opportunity. 1. Just how good a company is ARM? 2. How fast must it grow to justify its rating? Sales growth of 24% per annum in the last three years is the result of ARM’s monopoly position in a booming market. The company is a research factory that licenses microchip designs to chip makers. License fees should broadly cover ARM’s costs, leaving ongoing royalties on the sale of each device as pure profit. By good judgement and some luck, ARM Holdings plc (LON:ARM) has cornered the market in low-powered chips ideal for the battery-hungry smartphone market. It enjoys an astonishing 95% global share of smartphones, and 80% of digital cameras. Having built an ecosystem around its designs and a library of intellectual property, it’s replicating its lead in tablet computing. ARM’s fixed cost base gives it operational leverage, so higher revenues mean higher margins and much bigger bottom-line profit. Growth will slow when the burgeoning smartphone and tablet markets mature. With the lead time on the introduction of new designs around seven years, ARM Holdings plc (LON:ARM) is widening its end-market into laptops (via Windows 8), servers and the “Internet of things,” such as “smart” dishwashers. That butts up against six-times-larger Intel Corporation (NASDAQ:INTC), which dominates the market for PC and server chips but foolishly neglected the low-powered chip market. Now it’s fighting back, with its lower-powered Atom chips in some smartphones. The ubiquity of ARM’s designs means phone manufacturers are limited in how they can differentiate their products, and many must secretly wish the company would lose its stranglehold. So threats to ARM Holdings plc (LON:ARM)’s growth come from the risk of disruptive technology, be it from high-spending Intel Corporation (NASDAQ:INTC), Chinese intellectual property theft, or backwards integration from chip makers. Growing, but how fast, how long? “Forecasts of royalty revenues tripling over the next five years are common,” according to the Financial Times. That’s equivalent to a growth rate of 30% a year. Operational leverage means profits should grow faster but competition might drive down margins, so on a very broad brush basis let’s assume earnings also grow at the same rate, tripling over five years. The prospective P/E would then be 15 (the current market average) in five years’ time, if the share price remained unchanged. That analysis suggests there’s upside if the company can maintain above-average growth for more than five years. But it doesn’t leave much room for disruption from a competitor. It’s a close call. 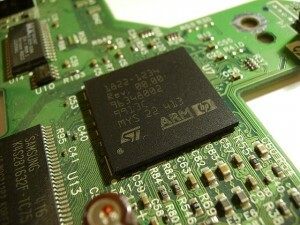 The article ARM Holdings (NASDAQ:ARMH) Is Cheaper, but Not a Bargain originally appeared on Fool.com and is written by Tony Reading. Fool contributor Tony Reading has no position in any stocks mentioned. The Motley Fool recommends Intel. The Motley Fool owns shares of Intel.